Learning how to winterize a home before leaving it for an extended amount of time can ensure that it remains in great condition, waiting for your return. Anyone with a home in a Northern or cold climate knows that you need to take some precautions for the coming winter. If you plan on living in the home all winter, without taking any extended vacations, you may seal your windows with plastic or storm windows to stop leaks and check to make sure pipes and walls are insulated. But what happens if you don't live there year-round, or are taking a holiday vacation for several days or more? In these cases, you'll need to winterize your home before you leave, to ensure no problems arise. 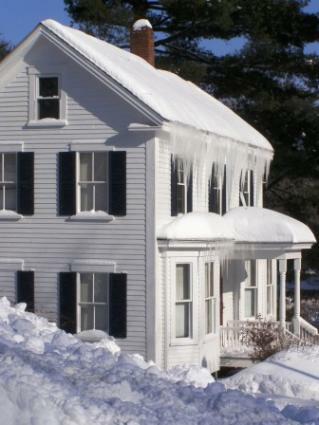 There are two major problems that can occur if you fail to winterize your home: burst pipes and mold growth. Pipes may burst and flood your home if the temperature in the home drops low enough for the water inside the pipes to freeze. Water expands as it freezes, which can split your pipes open. When the water thaws again, it can quickly escape the gaps in the metal, flooding your home. Mold growth may not be something you think about during the winter, but it can be a big problem for homes that have not been winterized. Surprisingly, this is actually a bigger problem for newer homes than older ones because newer homes tend to have fewer air leaks or gaps in windows and doors. When a house is well sealed, an unequal temperature arises between the interior of the home and the exterior, leading to condensation indoors. This condensation can get on everything including your furniture, rugs, bedding, walls and floors. This condensation can freeze if it gets cold enough, or it can harbor mold spores which will begin to grow and colonize in a thaw. Winterize your home anytime that you will be leaving for an extended amount of time, and turn off the main heating source in your home. With the cost of energy bills every winter, you may choose to turn off your furnace when you go out of town for the holidays, but be sure to winterize when you do so to avoid coming back to disaster. To ensure water doesn't freeze in your pipes, thereby destroying them and potentially flooding your home, you'll need to empty them. Go to the lowest level in your house, set up a few buckets and open the main water valve. Drain your hot water tank, water softener or filter and turn on all the faucets. Flush the toilets as well, and manipulate any hoses attached to sink sprayers or laundry sinks; the idea is to empty as much water out of your pipes as possible. Have a plumber shut off the water to your house from the street, or shut down your well pump and turn off the electricity to the area. This will drain your pipes completely. Leave the valves and faucets partially open in case of any remaining water. The most effective way to avoid condensation to the home is to allow air to travel freely. If you live in an older home with drafty windows and doors, remove any storm windows or plastic and keep the drapes open. For newer, tighter homes, open the screened windows a few inches in each room.Have a neighbor check periodically for condensation if you will be away for more than a few weeks. After 4 to 6 weeks of no electricity or heat, the temperatures inside and outside the home will have evened out and the windows can be shut. Once you've learned how to winterize a home, you can safely leave for the winter or a holiday knowing that you can save the energy costs while ensuring your home remains in the condition you left it in. Be sure to winterize any time you'll be away with no electricity or heat in your home, and enjoy peace of mind.